Funding will Boost Safety and Security at Non-Public Schools and Centers that may be Targets for Potential Hate Crimes. 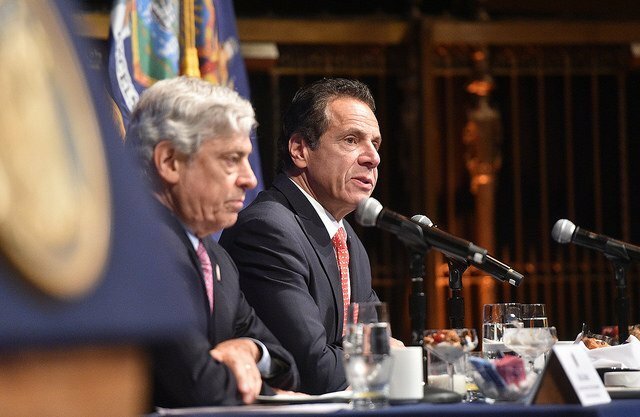 Albany, NY - October 30, 2018 - Governor Andrew M. Cuomo today announced that the $10 million grant program to help protect New York's non-public schools and cultural centers, including religious-based institutions, against hate crimes is now accepting applications. Building upon the success of last year's first round which provided $14.8 million in grants, the program provides funding to help strengthen security measures and help prevent hate crimes or attacks against these facilities because of their ideology, beliefs or mission. Day care centers, including those that are housed in community centers, and non-profit cultural museums are also eligible to apply. Following the deadliest assault on the Jewish community in US History, Governor Cuomo will attend an Interfaith Prayer Vigil hosted by Central Synagogue in New York City this evening with New York Interfaith leaders, including Rabbi Angela Buchdal, Cardinal Dolan, Reverend Amy Butler, Pastor Amandus Derr and Rabbi Chaim Steinmets. Additionally, the Governor directed that flags on all state government buildings be flown at half-staff until sunset on Sunday, November 4 in honor of the victims of the shootings at the Tree of Life Synagogue in Pittsburgh and at a supermarket in Jeffersontown, Kentucky. "Here in New York, our diversity of races, cultures, religions and beliefs has always been our greatest strength and we need to protect that legacy," Governor Cuomo said. "Hate crimes have no place in New York and this funding will help those who are targeted due to their ideology, beliefs, or mission to take additional steps to increase the security of their facilities and keep our communities safe." "Following the horrific shooting at Tree of Life Synagogue in Pittsburgh, we are stepping up our efforts to ensure all New Yorkers are protected from hate crimes," said Lieutenant Governor Kathy Hochul. "In New York, our strength is our diversity and we will not tolerate hatred against individuals due to their culture, religion, or beliefs. This grant funding will enhance security measures at cultural centers, nonpublic schools, and religious institutions to keep New Yorkers safe." The grant, which is administered by the State Division of Homeland Security and Emergency Services, will provide up to $50,000 in funding for additional security training needs, cameras and state-of-the-art technology, door-hardening, improved lighting and other related security upgrades at each eligible facility. Organizations that operate more than one facility may submit up to three applications for a total request of up to $150,000. Applications for these awards are due by 5 p.m. on December 19, 2018. The program was announced in October 2017 by Governor Cuomo and first round awards were made earlier this year, providing $14.8 million in funding for 305 projects at facilities across the state. This program is just one piece of an extensive effort launched by the Governor to combat hate crimes in New York. The Hate Crimes Task Force was created last year to mitigate recent incidents of bias-motivated threats, harassment, and violence in New York. The Task Force agencies - State Police, Division of Human Rights, and the Division of Criminal Justice Services - engage local stakeholders and law enforcement agencies to identify and investigate hate motivated crimes and bias related trends, community vulnerabilities and discriminatory practices. Division of Homeland Security and Emergency Services Commissioner Roger L. Parrino Sr. said, "Our diversity is also our strength. Schools, day care centers, and community centers need to be safe place where ideas, beliefs, and cultures are shared and fostered. I applaud Governor Cuomo's actions to provide this funding to these non-profit organizations that could be targeted by nefarious individuals or groups just because of who they are or what they believe in." Additionally, the Governor established a telephone hotline and text line through the Division of Human Rights to report incidents of bias and discrimination, as well as a dedicated Hate Crimes Unit in State Police. Texts are monitored by the State Police, who handle any potential criminal matters. Cases of discrimination that are covered by the New York State Human Rights Law may be further investigated by the Division. A $5,000 reward is also being made available for any information leading to an arrest and conviction for a hate crime. All New Yorkers who have experienced bias or discrimination are encouraged to call DHR's toll-free hotline at (888) 392-3644 from 9 a.m. to 5 p.m. Monday - Friday or text "HATE" to 81336. If you want to report a crime or fear for your safety, call 911 immediately. The Division of Homeland Security and Emergency Services (DHSES) provides leadership, coordination and support for efforts to prevent, protect against, prepare for, respond to, and recover from terrorism and other man-made and natural disasters, threats, fires and other emergencies. For more information, visit the DHSES Facebook page, follow @NYSDHSES on Twitter and Instagram or visit dhses.ny.gov. Subject: LongIsland.com - Your Name sent you Article details of "Governor Cuomo Announces $10 Million Grant Program to Protect NY's Non-Public Schools, Cultural Centers, Religious Institutions"